Social media and its uses are increasing day by day with every passing second around the world, its utility is also increasing in Pakistan and people are understanding the use and power of social media. Many issues that were too controversial to be raised are now supported on the internet and the horizon of people is expanding. Pakistan is a country which is going through corrupt leadership and bad governance when a nation is going through such issues; problems faced by common people are always overlooked but social media and digital media is providing such platforms for people to come up and speak for their rights. Social media and digital platforms are not just providing a platform for business to reach out masses and grow but it is also giving the true freedom of speech and power to the opinion of ordinary people. The strength of social media and social media websites is increasing day by day but so far we need a comprehensive analysis to understand it in detail and properly that how can we further utilize and get benefits from this whole global world created by the internet. 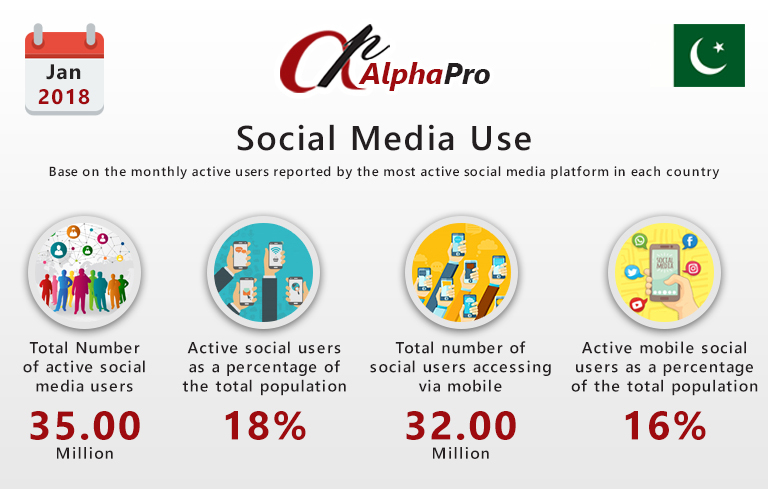 This in detail analysis and report regarding the social media usage in Pakistan is pulled together by AlphaPro. AlphaPro is a digital marketing firm who has been taking many initiatives to enlighten the use benefits and utilities of social media, recently they have also conducted Pakistan’s first ever Social Media Summit gathering more than 350 socially active influential people on one platform to spread awareness regarding everything what’s in there for a normal person. The above chart shows the statistics of Pakistan’s population and the number of people who are active users of the internet, mobile users, social media users and mobile social users. The main concern is to know how much of our total population is active social media user to know how much influence we can create by approaching on social media. Social media is one of those technological changes you can’t resist as with time everything starts to depend on them. The stats of Pakistani people actually having access and actually using social media on an active basis shows that we have so much of people to still make aware and reach out in order to make Pakistan socially active. The stats show that only 44.6 million out of 198.9 are internet users in Pakistan which means only 22% of our total population has access to internet, even out of them only 35 million are active users of social media which means only 18% are social media users. If you look deeper about the number of mobile users you will get to know that 109.5 million out of the total population uses mobile and among them 32 million are active internet and social media users from their mobile devices which is just 16% of our people. All these stats show that we have a lot to do in this sector as compared to the developed countries. We need to create awareness regarding the healthy and efficient uses of social media. We need to realize the wide horizon people have on the social media. Our people use it just for time pass and connectivity whereas the true essence and power is overlooked. The most commonly used social media websites on the internet by the people of Pakistan are these six including Facebook, YouTube, Twitter, Pinterest, Instagram and Google+. The info graphic is a clear elaboration of how people are using these social websites. 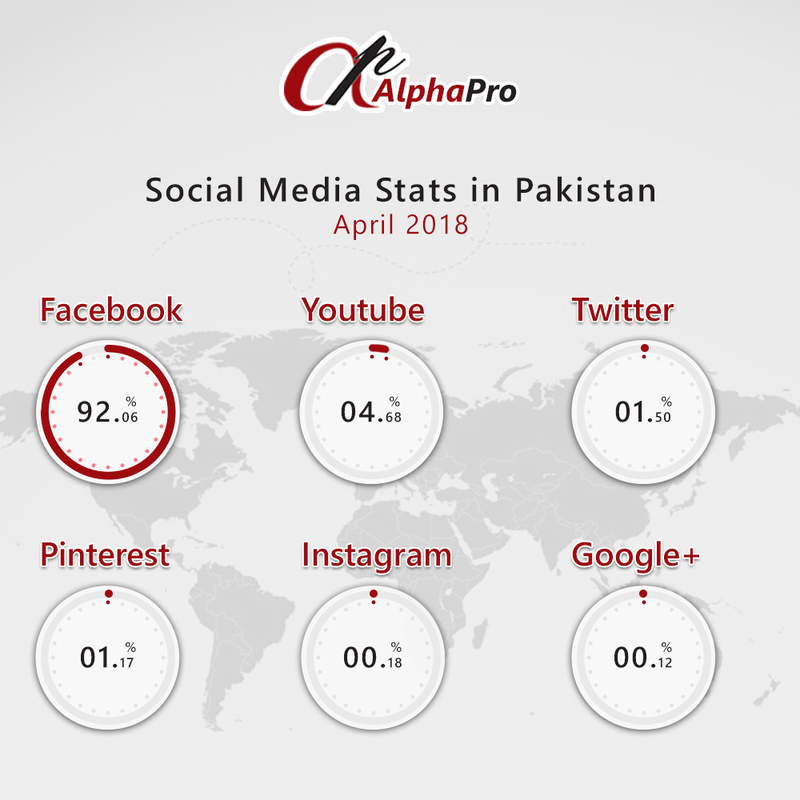 The most used social media website that people of Pakistan are using is Facebook as 92.06% of our population which has access to internet is actively using Facebook. The Stats in this info graphic shows that people of Pakistan are just familiar with Facebook and many of them are just using it for the purpose of connectivity with friends and family however ignoring the other vital uses of social media. With time and with certain awareness programs like Social Media Summit ‘18 can bring change in the utility of internet. The overall stats show that people are only aware with Facebook and are not adopting other social websites as much as they use Facebook. The reality is that all the other platforms are as much of an opportunity as Facebook but people of Pakistan might find it more user friendly. These statistics show detailed information about the usage of Facebook among Pakistanis, the number of active Pakistani users monthly on Facebook are 35 million which has increased by 17 % annually in 2017. 91% of users access Facebook by mobile. The users when classified based on gender shows that 23% profiles were identified as females and 77% as males. This next info graphic shows the number of followers of the biggest local Pakistani pages in the different industries. To be more specific the data is from the total number of Local Fans/followers for the largest 200 pages in Pakistan by Fan count. The stats show that people use Facebook more for the sake of fashion than any other thing. The stats have been carefully studied to come to these results which show that most followers are of fashion industry. 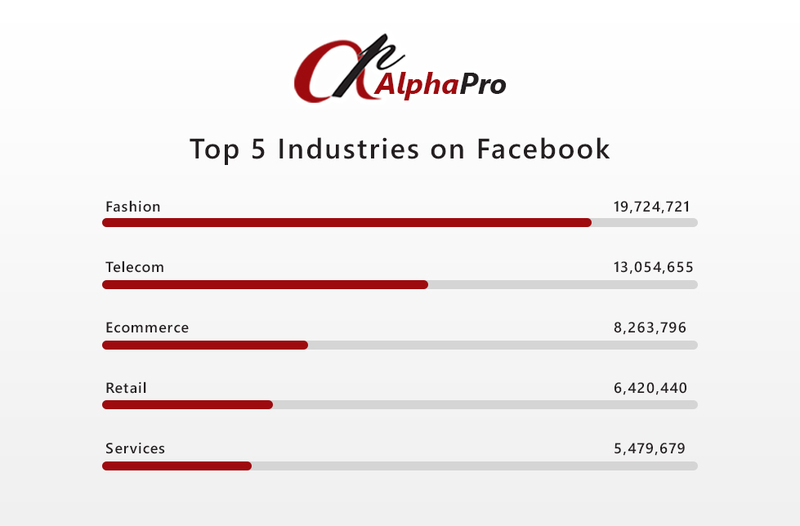 After fashion industry the people follow telecom sector on Facebook. Ecommerce is also booming for people of Pakistan on Facebook. Retail and services are next. These all stats show that people of Pakistan are now getting involved in retail activities online, in the beginning people were too reluctant in adapting this totally new experience of buying intangible stuff but with time trend is changing and a good amount of people are involved in online purchases. Still the numbers are growing each year and the people are becoming aware. However Pakistan still need to make people aware regarding the uses and utility of social media and digital market. Instagram is a relatively new thing for Pakistani people and is less popular among the common people however the upper class is obsessed with its various uses. We have 5.2 million monthly active users on Instagram, the number is very less as compared to the Facebook users which was 35million. 5.2 million is just 3% of our population the rest is still a target. On Instagram also the number of male users is more than female users. 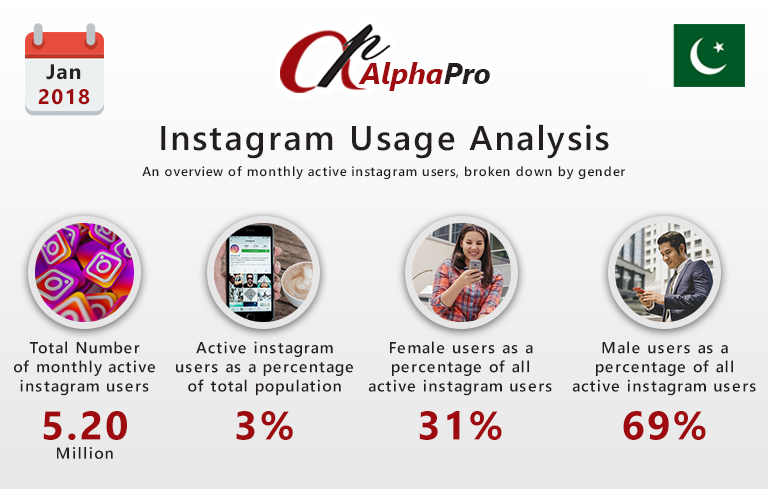 31% of the total active Instagram users are females where as 69% are males but the numbers are increasing with time. Out of Pakistan’s total population of 198.9 million only 35 million are an active social media user on different social media websites, which makes only 18% of the total population. Out of these 35 million 32 million access the internet through their mobile devices. People only use Facebook and Instagram on active basis so we only highlighted these statistics other websites have very low statistics so we will highlight them in the coming report. Pakistan’s market still has so much potential to bring more users active online. 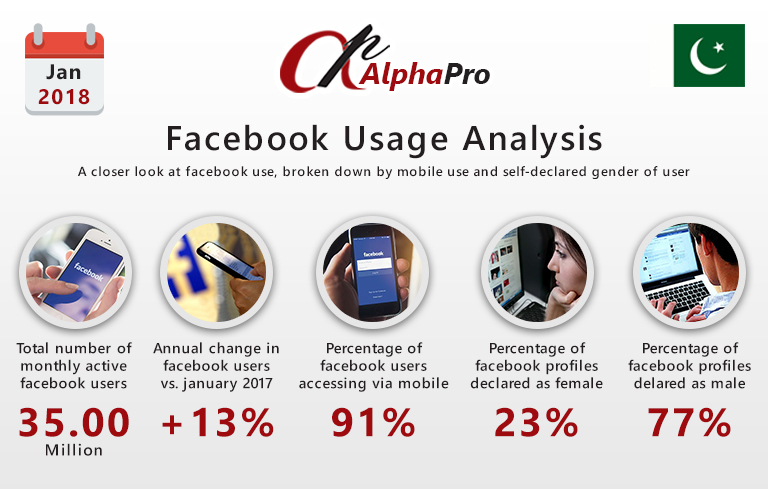 This is a target taken by AlphaPro to make people aware of the social media and it’s power as a tool to solve any issue. We will educate people regarding the positive potential uses through activities like workshops and social media summit that we have already conducted and have planned in the future as well.